You get an I/O Error saying 'The Parameter is incorrect'. In the settings screen, change the 'Transfer Length' option to 'Manual' instead of 'Automatic' and put it on '32 KB' instead of '64 KB'. You're burning at slow speeds. 'Slow' typically being no more than 2x - even on higher rated media. 1. Your drive is slowing the burn down on purpose so you don't create a coaster. This is because it has determined you're using crappy media. To check your DMA settings, go into Device Manager and look in the IDE Controllers branch. If you bring up the properties box on each of the channels (Primary and Secondary) you should see a tab where it lets you change between PIO and DMA mode. The above applies to Windows 2000, XP etc. On a Windows 9x machine, you'll need to look at the properties for the drive itself under the 'CDROM Drives' branch. You should see a 'DMA' checkbox in there somewhere! Windows XP will often get confused and report that a drive IS running in DMA mode when in reality, it's not. To fix this, Uninstall the IDE/ATA Controller (NOT the Channels!!!) 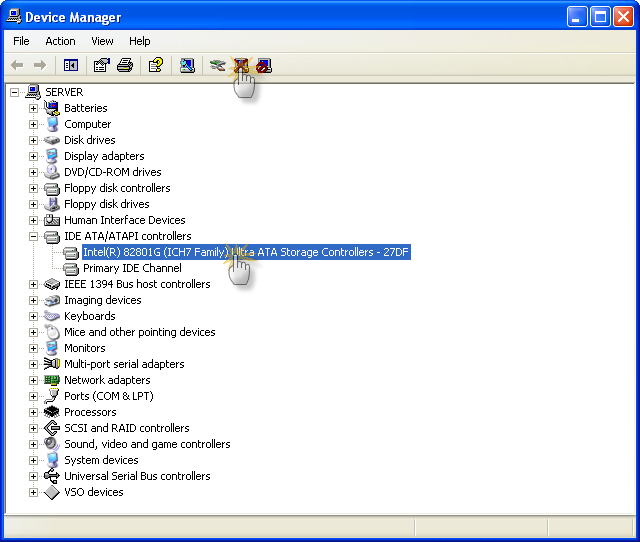 from under the IDE ATA/ATAPI Controllers branch (again in Device Manager) and reboot your PC. Windows will 'find' it again when it boots back up. DMA will be enabled by default. The alternative is to use the 'Reset DMA' option found on the 'Tools' menu within ImgBurn. I know it works on XP, but I'm not sure about other versions of the Windows operating system. Either way, it won't do any damage so you've nothing to lose by trying it. You should also check that DMA is enabled and active within the system BIOS screen. That's the screen you access by pressing DEL, F2 etc when the machine first boots up. You normally have to enable it for each device connected to the IDE bus - it's not a single setting to enable / disable it. Setting it to 'Auto' is the best bet - rather than DMA 5, 4... 1, PIO 4, 3...1 etc. I have installed the Adaptec ASPI manager but ImgBurn can't find my drive(s). *NOTE: Only applies when I/O Manager is set to ASPI - and therefore should only apply to old operating systems like Windows 95, 98 and Me. Firstly, I just want to point out that this IS NOT ImgBurns problem!!! Download + import the appropriate REG file for your operating system. It should fix the problem. Type 'Regedit' and then click the 'Ok' button. If it already existed, ensure its 'Data' value' is empty. If that doesn't work, try installing the Nero ASPI manager. Be warned that Adaptec ASPI doesn't support USB / Firewire (Or at least I dont think it does!). I'm getting a 'You need Administrative privileges to use SPTI' error when I start the program as a restricted user. SPTI is available to Administrators only. Microsoft designed it like this, don't blame me! Update: The policy/registry option mentioned below can now be manipulated directly within the ImgBurn setup program. You just need to enable the 'Enable SPTI access for all users.' option. Other workarounds mentioned within this post still apply. Update 2: This should no longer be a problem as of Windows Vista (i.e. so Vista and any OS that came after it should work). It seems Microsoft opened up SPTI (for optical drives anyway) to everyone. Note: Only tested on XP and Server 2003. Wording may differ on other operating systems. Windows XP Home Edition doesn't have 'secpol.msc' so you'll have to edit the registry directly. Add a new String called 'allocatecdroms' and set its value to '1'. 0 = Administrators in the domain can gain access to data on the compact discs in the CD-ROM drive. 1 = Only the user logged on locally can gain access to data on the compact discs in the CD-ROM drive. Please note: You'll need to be logged in as an Administrator to import the registry file and you'll need to reboot having done so. Yet another option is to use the Nero BurnRights tool. I believe this actually modifies the permissions on the device object (for some, this might be better than changing the group policy option). You can also use it to setup a security group that you can then add certain users to rather than giving everyone access to burn discs. ImgBurn supports several other I/O interfaces besides SPTI and there's always a chance that one of the others is already installed on your machine. Go into the Settings and change the 'Interface' option on the 'I/O' tab to see if any of the others will work for you. If none of them do you'll have to install an application that installs one of the other supported I/O interfaces and then tell ImgBurn to use it. You can use ElbyCDIO by installing some software from Elaborate Bytes or SlySoft - i.e. CloneDVD or Virtual CloneDrive. You can use Patin-Couffin by installing some software from VSO Software - i.e. VSO Inspector. Some old drives can cause this to happen. The program sends a command to them that they just dont like and they hang! They shouldn't hang, they should just respond with a 'I dont understand'. If a drive hangs, the program hangs. To find out where exactly the program is hanging (or rather, which drive is causing the problem), simply run the attached REG file when ImgBurn is CLOSED. It will enable a little built in feature known as 'I/O Debug Mode'. This logs all data sent to the drive so I can work out what exactly is causing the problem. Once you've run the file, open ImgBurn again. You'll see a lot more being put into the log. When nothing else is added, simply highlight everything in the log (Edit -> Select All) and then copy (Edit -> Copy) to your clipboard. You can then post details about it in the support forum and include the full log - by pasting it from your clipboard. Important Note: Do NOT run this file for ANY other reason. I've deleted some files but I'm not getting my disk space back. OK, well the obvious thing to check here is that they're not in your 'Recycle Bin'. Right click on it and hit 'Empty Recycle Bin'. Still not got the space back? I expect you have a Norton (Symantec) tool installed that has added the 'Norton Protected Recycle Bin' feature to your standard Recycle Bin. The 'Norton Protected Recycle Bin' stores files you delete that don't go into the standard Recycle Bin. It has its good and bad points I guess. The bad ones are mainly that if you don't know it's installed, you end up running out of disk space! As before, right click the 'Recycle Bin' (that's probably actually called 'Norton Protected Recycle Bin') and select 'Empty Norton Protected Recycle Bin'. That should give you back the space you thought had gone missing. You've used media that your drive doesn't like very much. Basically I'm saying it can't read it - or at least not quickly enough to provide smooth playback. Please refer to the 'Which DVD-R media should I buy?' FAQ posted above. You need to update your IDE drivers. Your current ones are old and don't support this IMPORTANT feature. Another program is currently using the drive. You need to find out what it is and shut it down! If it finds something, click on it in the search window. The main window should then highlight the process / 'File' entry that contains the handle to the drive. You can right click -> close the handle if you like, or just close the entire application, it's up to you. Once installed you can just right click the drive in explorer and select the 'Unlocker' option. Hopefully it'll present you with a window listing all the applications that are using the drive. This tool is great in that you can use it for anything that's locked and supposedly in use by something else (something that's very common when you're trying to delete files!). Sorry to have to tell you this but you've got a virus. When the program is run, the virus is infecting the exe. This change means the CRC checks fail in the EXE loader and it wont load again. Invest in a virus killer and wipe the nasty thing out. Don't leave your machine unprotected again!!! I get an error message saying that the required 'shfolder.dll' file is missing. You must be running a VERY basic installation of 95/98 etc without an up-to-date version of Internet Explorer installed. Normally this file IS already on the pc. Visit this link and download a package (containing it) from the Microsoft website. Well, it's that or update your installation of Internet Explorer.... or better still, your operating system! You're getting an error message about DirectShow decoding your audio files to digital silence when you try and burn an Audio CD. Certain encoders (LAME 3.92?) can produce files that the standard Fraunhofer IIS MP3 DirectShow decoder ( l3codecx.ax ) doesn't like and cause it to output digital silence without reporting any sort of error. ImgBurn can detect this and will warn you about it. Get an updated version of l3codecx.ax! Windows XP ships with v1.5.0.50 but there's a newer v1.9.0.311 floating around on the internet. Find it, download it and keep it somewhere safe. Now copy the updated decoder file to %systemroot%\system32 (i.e. C:\Windows\System32) and overwrite the old one. Reboot your PC and try burning the disc again. Microsoft have released an update to fix a security issue found in the original codec. This newer version (1.6.0.51) has also been found to fix the digital silence issue. Windows Vista was the first Microsoft operating system that can read/parse/understand the UDF 2.50+ file system. Operating systems that were released prior to Windows Vista will either complain the disc is corrupt or just think it's totally empty. There's a workaround for Windows XP (may work for other OS's too, I've only tested it on XP) whereby you install a 3rd party driver and that solves the problem. There are two such drivers that I know of, one made by Panasonic and another made by Toshiba. You get an error in the ImgBurn log window saying 'No Devices Detected!' and your drives are probably missing from Explorer (My Computer). You may also find the drives have a yellow exclamation mark next to them in Device Manager. This issue could be due to missing/incorrect filter drivers. All drive I/O has to pass through these drivers, so if one messes up, the I/O gets lost and never reaches the drive or gets back to the software that issued it.